It occurred to me today that before learning about John Summerson’s list of the toughest climbs in California I would just go out and do repeats on Palomar Mountain. Palomar ranks 9th on the most difficult climbs in California and 10th in the country! How convenient to have such a storied climb in my backyard — San Diego. But since learning about his book I have made the effort on several trips to climb the hardest climbs in California. Yesterday I climbed Mosquito Flat and another climb Pine Creek. Today I climbed Onion Valley Road. I PR’d Mosquito Flat yesterday and Onion Valley Road today — check back for a ride report. The graph above was back in 2006 when I was getting ready for my first Everest Challenge. 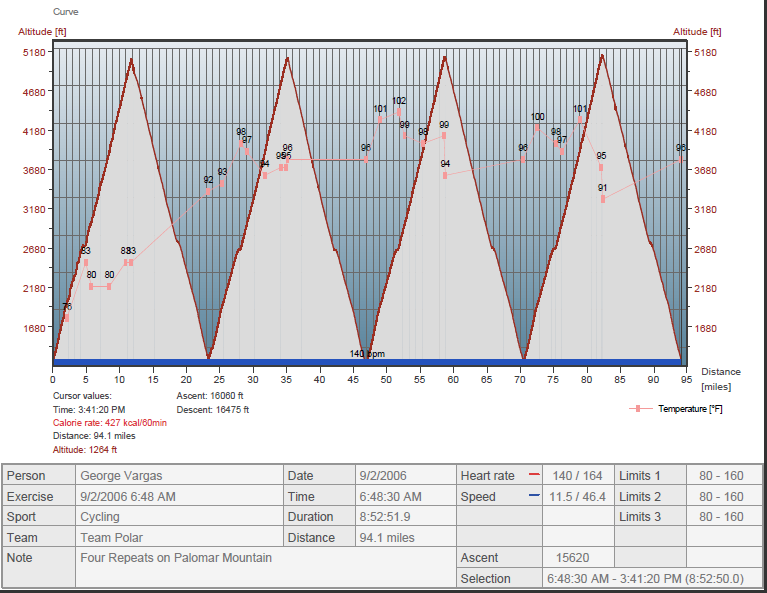 The first day of the race has over 15,000 feet of gain with little flat (read recovery) in between the climbs. So why not do repeats and get the same cumulative gain with short recovery? Made sense to me and so I embarked on FOUR REPEATS ON PALOMAR MOUNTAIN. To say this was a hard day on the bike is an understatement but mentally and physically I was more than ready to take up the challenge of the toughest two day stage race. The 100F temperature also played a big factor in my overall fatigue. In case you’re wondering I kept my climbing repeats between 1 hour 20minutes and 1 hour 30 minutes. By the third descent I could have descended the upper half blindfolded 🙂 The fourth climb was a bear. The fourth descent was the sweetest!! 9) Mount Palomar– DONE 6/06/10!! 10) Mosquito Flat– DONE 09/02/10!! Below is a list of some of the top cycling climb bike rides that are listed in the bookBest Cycling Climbs In The US . The book lists the 100 toughest USA road bike climbs from 1 to 100. Thank you for reading my blog. Please pass it on to your friends. This entry was posted in Everest Challenge, Palomar Mountain by REV Cycling Directeur Sportif. Bookmark the permalink.